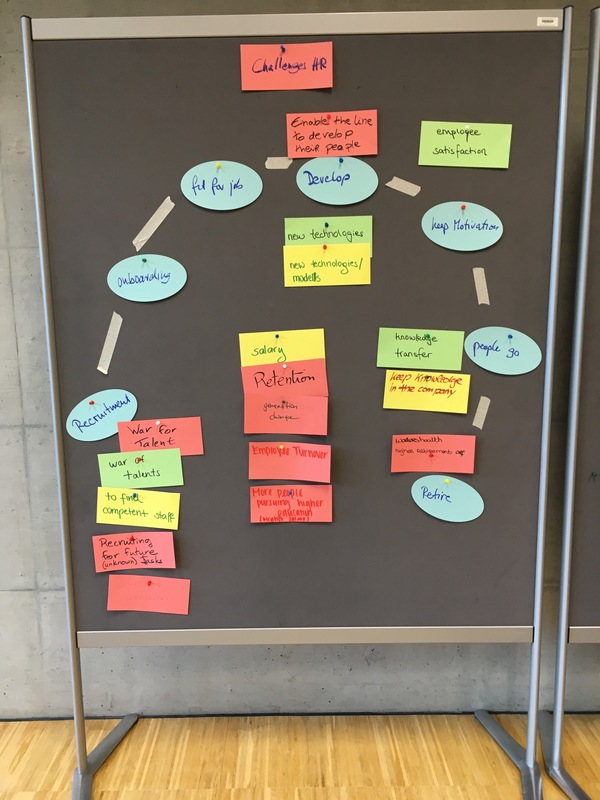 Heide and me had a seminar with the simulation Tango last week with students of HR at the University of Applied Science Vorarlberg in Dornbirn, Austria. The goal: Understand the challenge of people in a company and create a people strategy following the business strategy. Get some inspiration from a short video about the flow of the game and reflection. We had some intensive discussion after the Tango experience and I like to share that with you. Tango is a board game – simulating a company that grows with people and they look for Image and Knowledge. These are the attractors for people and customers alike. When we used the simulation for HR thinking – we focussed more on people. Our reflection frame was the life cycle of a talent. The employee enters the company in a hiring process and ends the engagement some day – or retires. HR-people and managers need to understand this cycle and how to set it up right. Look at this good graphic of the life cycle of an employees in a company. It helps to understand the different stages and of course it matters, at which personal stage the recruiter is – young or old, singe or married etc.. so we combine the life cycle of an employee in a company with the individual life cycle of a human being. What else do we learn in Tango? 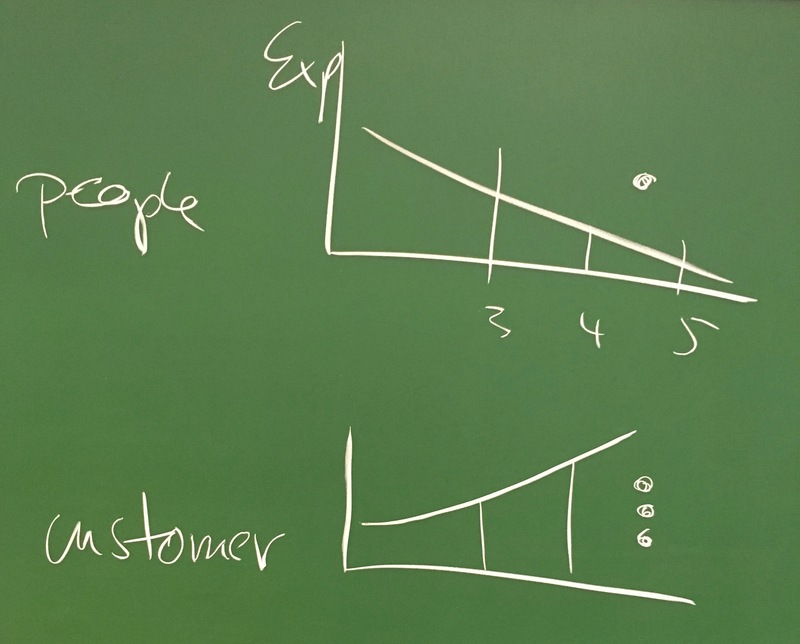 The design of the simulation creates a shortage of good experienced people within the played four years and the early customers try to get the service cheaper and cheaper. If you stay with these customers, you ruin your cash flow and earnings. But there are options – to scale up, if you keep your well-developed project people. With them you will serve customers with high expectations on knowledge and experience and you will earn really good money. The challenge: You need to say goodbye to your customers who are financially unattractive when the new potential becomes visible. In the game, you lose reputation (image) – as they will not be happy with your decision not to serve them anymore – but you will have future earnings with new demanding customers. And this is a tricky situation: You loose now in order to win in the future. People hate that, specially sales people. The pain of loosing is 10 times harder that the joy of winning in the future – and that is why people hesitate to do it. 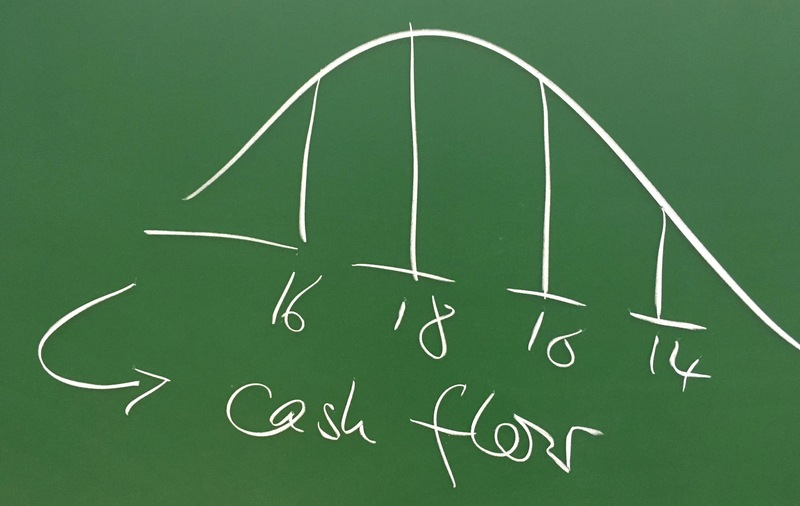 There are many studies about this phenomenon from Universities like the University in Chicago about Behaviour in Economics and Daniel Kahneman from Princeton University. We also observed behaviour in the game that people try to stay with what they can control or know. If you are not the leading team, you try to avoid losses. These teams are not attracted by new opportunities and insights offered – they stay with what they know and what was successful so far. They try to avoid mistakes and risks. Most people do not even recognise that they have this avoidance behaviour … and that is what frustrates the active people in the team, who would like to try something new. If it is too hard to convince the team, they will give up. But in the new world, we need to make decisions in uncertainty. We need to try out and fail early, like in software industry or research intensive industries. If you go on too long on unsuccessful projects you waste resources. So most of the learning is not only in the game – but also what the participants do or do not do. If the debrief can reflect on their behaviour and the outcome, they understand more easily. First comes the action, the experience of decision making in the situation and than the observation of the facilitators and the reflection about it in the teams and later in the plenum. Most of the time we see a lot of old patterns of behaviour – and to challenge them in a good context is what creates the learning. If you need to transform your company, it is not about logic, it is about unlearning old behavior and this is emotional. So the facilitators and the companies need to set the frame what the new works will look like – before the game starts. With changing frames of reference, the simulation gets a different de-briefing. HR will not do these jobs because they really do not know. What? Who is the best match for a team is not only a question of knowledge and university degree, but of matching values, believes and motivation. A match is when they like working together. The best way to find out is if the team is responsible to find the new teamplayer – recruit through their own networks, find an agreement about the onboarding and get them fit very quickly, so the team has the advantage of it. The team will organise the working time, the overtime, the vacation time, the benefits and the parties for identity. The team is the power-cell and will organise itself. And it will be the team that is rewarded – at least higher than the individual in it. What a cultural change! This culture is more at home in Asia …. but you might ask why in Europe and other individualistic countries? Listen to the Discussions with Talent managers from a bank – after Tango – short video 4,25 min in German language. What is the new ? It is the world of the marketing, R&D Departments, supply chain, purchasing – all kind of support functions in companies that sell products and services. They need to be more efficient, that means, their thinking has to serve the people and the customers. As their old measurement is sales and ebitda – they reduce vendors, reduce job-sharing, you do not have proper knowledge sharing and documentation. Every meeting is a waste of time? Sounds familiar. But this most efficent lean way has a dark side: You do not build up knowledge and flexibility. We reflected the future role of managers of teams and it became clear that it was not so much what they should know, but more the question whether they are still there. The role of the teams and chapters (many teams) will not need many leaders – and their role is to observe the teams and coach them, support them with resources and communicate the results with the board and other teams. It is more the role of a communicator than the role of the one who knows. 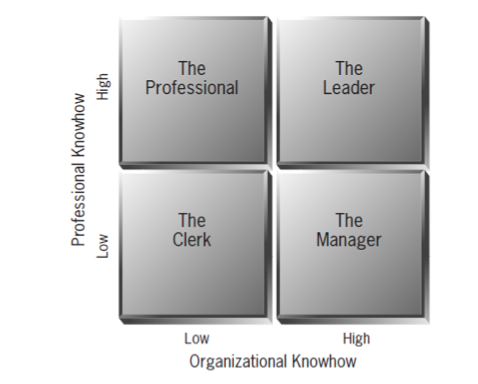 If you look at this chart – it makes a lot of sense that managers develop to leaders and clerks will be replaced by smart machines. We scale up the knowledge in knowledge intensive companies. When you look at the article of McKinsey refereeing to this topic – the new structures have already started and companies talk about squads and tribes – chapters and teams. „In this world, the work of a traditional midlevel manager is reallocated to three different roles: the chapter leader, the tribe leader, and the squad leader. Let’s examine the responsibilities of each and the challenges they pose for traditional managers looking to become agile managers.“ Article The Agile Manager, McKinsey July 2018 by Aaron de Smet from Boston Office. There are companies that still have a lot of expensive assets and need to make profit from it by making the processes more and more efficient and lean, reduce all admin to a minimum, digitalise processes and reduce bureaucracy. Some of these companies are still old industry: Energy, steel, paper, cars, food, chemicals and the pharmaceutical industry. And there is the world of companies that has no more assets, they use long supply chains and change supplier when needed. We all know the stories of Nike, Dell and Apple. The power is in the brand – not in the production. Some people thought, you cannot copy it. But they did: Acer was a supplier of Dell and when they learned enough, they started their own brand – and are very successful not only in Asia. The boardgame was designed by Celemi chief-designer Klas Melander, when Dr. Karl-Erik Sveiby asked for support to make his new model of intangible assets clear and visual to the financial public. Theory was too academic – they needed a hands on experience. That was in the 80ies. What has changed is the amount of companies that have their earnings from service and knowledge. Learn more about the ideas in this recommendation written by Sveiby in 2013. And it has the same core: People first. Not only that the „Agile manifesto“ starts with people first – it is the believe in the Tango simulation. 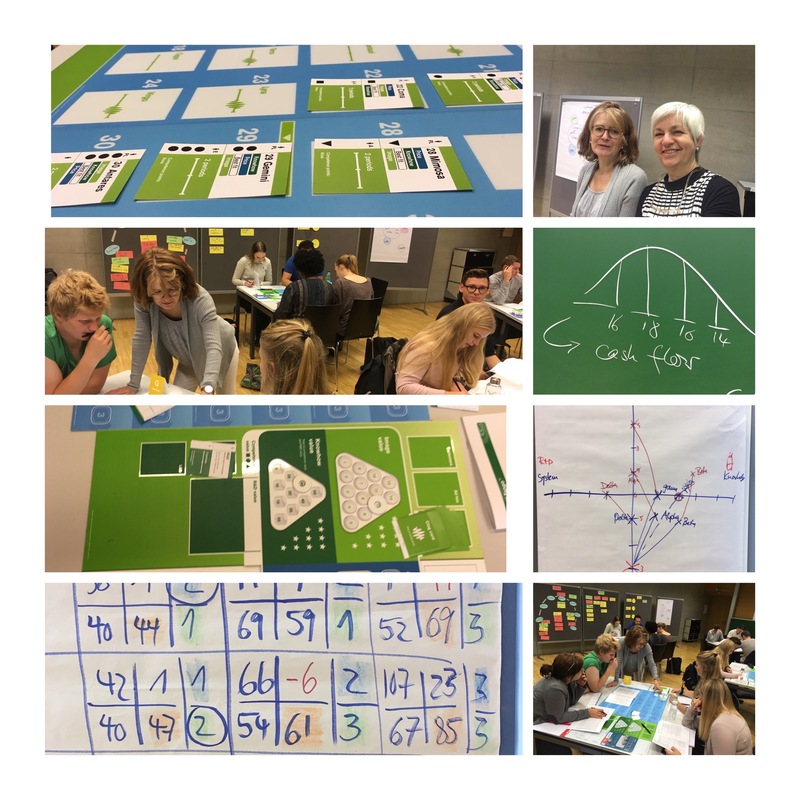 If it is important for your company, that your people get a different mindset, use the simulation to let them find their own way – making their own conclusions, reflecting on their ideas and situations in real life. As there is much more motivation for people if you create it yourself – and not that somebody tells you how. Tell them why … let your people start thinking and find their way to do it.